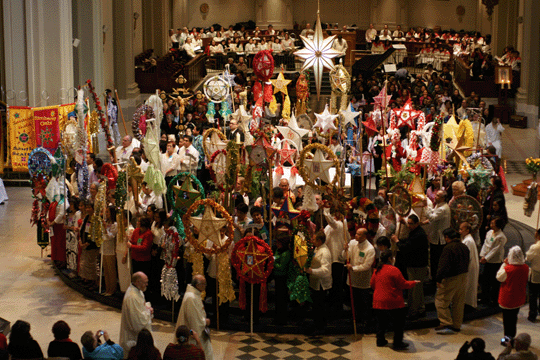 Though its celebration isn't supposed to begin til the pre-dawn hours of the 16th, given the prevalent pastoral need on these shores, at this hour another year of the Stateside edition of Simbang Gabi is already underway from coast to coast. Back in the Philippines, meanwhile, the First Night (or early morning) went off with its usual flair... literally -- keeping with tradition, fireworks marked the Opening Mass at several churches. And, well, all this stands to illustrate these days' Biggest Story among us. For most of its history, both culturally and in its numbers, Catholicism on these shores took its lead from points East. Now, though -- and as never before -- the look, feel, strength and promise of this faith's future in our midst are driven from a markedly different direction beyond our borders: namely, the South and West... the spiritual children of el Cerrito de Tepeyac and the Cathedral of Manila just two groups among many others... yet even so, all the more with each passing year, no days of the calendar serve to signify the Stateside church's most dramatic sea-change in nearly two centuries more than those of this very week. The Bish Who Stole Christmas?